This document describes the symbol library and gnetlist backend which supports driving SWITCAP simulations from the gEDA/gaf system. 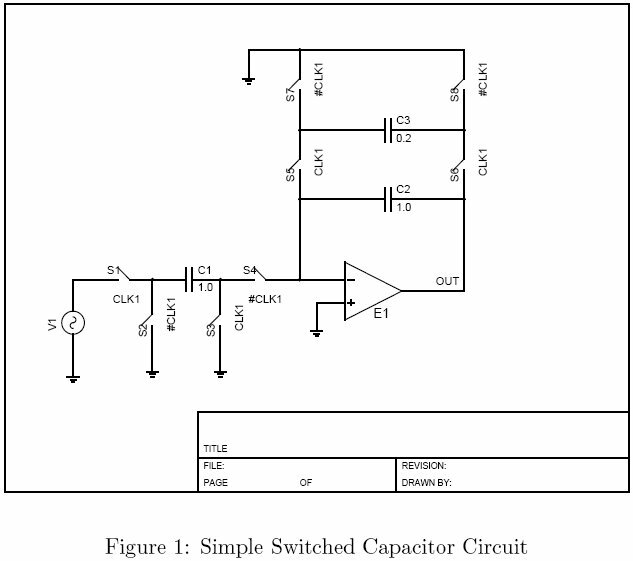 SWITCAP is a switched capacitor circuit simulator available from Columbia University. It is used in many classroom and research environments. 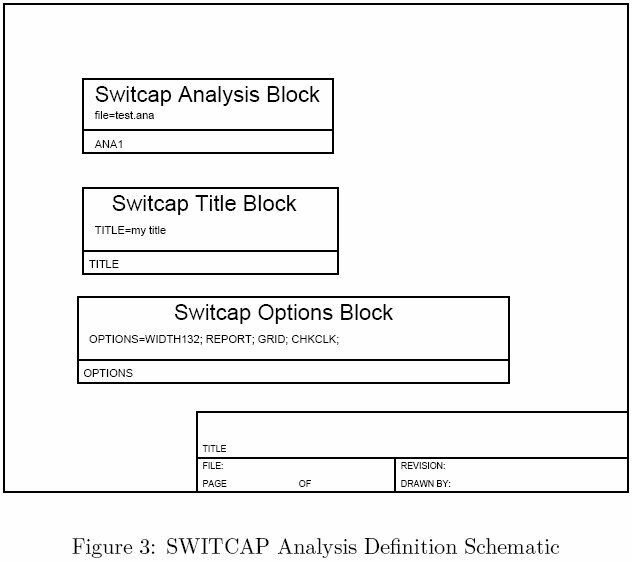 One drawback to SWITCAP is the lack of a freely available schematic capture frontend. The gEDA/gaf SWITCAP symbol library and gnetlist backend tries to fill that gap. Create schematics of the circuit. Run sw2asc to extract the results. View the results with gwave. A recent version of gEDA/gaf. To see if your version is recent enough, see if the directory $prefix/share/gEDA/sym/switcap exists. $prefix is the installation prefix for gEDA on your system. SWITCAP. The executable is usually called sw. If you do not have SWITCAP available on your system, you will need to contact Columbia University to obtain a copy. The gEDA/gaf SWITCAP support was tested with SWITCAP Version A.5R Release 21-Sep-87. 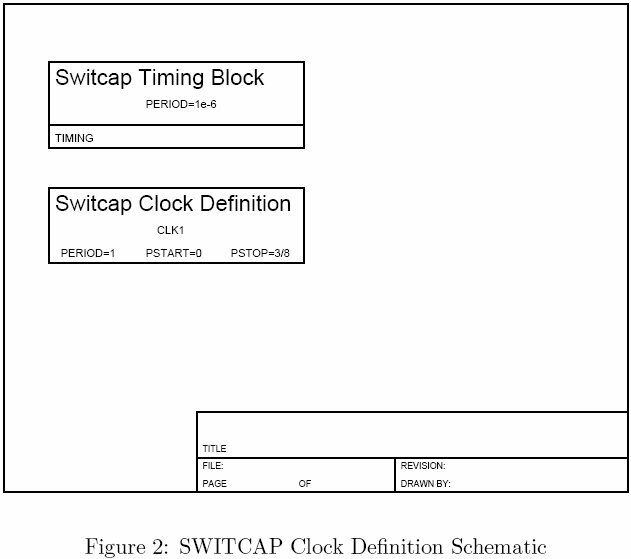 One instance of the switcap-timing symbol. This symbol will set the master clock period for your simulations. One or more instances of the switcap-clock symbol. This symbol defines a clock with a particular phase and period. The reference designator of the clock symbol is used by the switches to set what phase they switch on. One or more instances of the switcap-analysis symbol. 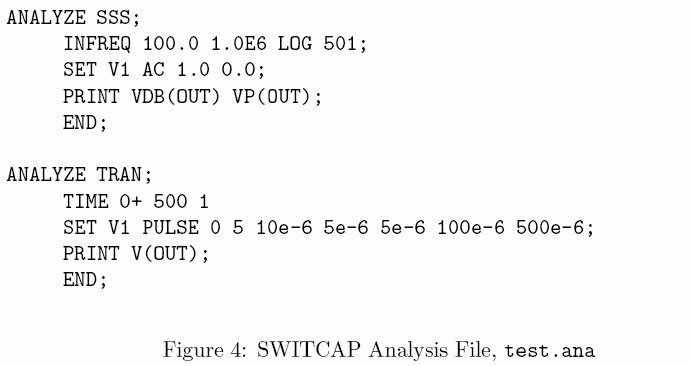 This symbol defines an analysis by specifying a file to include in the SWITCAP netlist. By including multiple instances of this symbol, multiple analysis files may be included. Zero or one instance of the switcap-title symbol. This will add a TITLE: line to the SWITCAP netlist and will appear in the output file. Zero or one instance of the switcap-options symbol. By editing the OPTIONS attribute on this symbol you can set the various options which can be passed to SWITCAP. When creating schematics to drive SWITCAP, you should name all nets that you wish to plot. To avoid possible conflicts with unnamed nets, you should avoid using purely numerical names for nets because all unnamed nets will be assigned (somewhat randomly) numbers without checking for possible conflicts with explicitly named nets. SWITCAP limits the length of node names to 7 characters. When placing switches on your schematic, you will need to define which clock they are controlled with. This is done by setting the clock attribute on the switch to the reference designator of the clock which should control it. The netlist will be left in example.scn. so I can use command history to rerun SWITCAP without having to manually type the file names each time. Refer to the SWITCAP manual for more details. C=capacitance. Required. Specifies filename to be included. refdes=reference designator. Required. Must start with “C” and be unique. clock=Controlling clock. Required. Specifies which clock controls this switch. refdes=reference designator. Required. Must start with “S” and be unique. refdes=reference designator. Required. Must start with “V” and be unique. gain=gain. Required. Specifies the gain of the controlled source. refdes=reference designator. Required. Must start with “E” and be unique. PSTART=starting clock phase. Required. Specifies on what phase of the master clock this clock turns on. PSTOP=ending clock phase. Required. Specifies on what phase of the master clock this clock turns off. PERIOD=clock period. Required. Specifies the period of the clock in terms of master clock cycles. refdes=reference designator. Required. The switches that are controlled by this clock will refer to it by the reference designator. As such, avoid running any reference designator renumbering tools. PERIOD=clock period. Required. Specifies the period of the master clock in seconds. Only a single instance of this symbol is allowed. file=filename. Required. Specifies filename to be included. TITLE=switcap title. Required. Specifies the TITLE line for the SWITCAP netlist. OPTIONS=switcap options. Required. Specifies the OPTIONS line for the SWITCAP netlist. See the SWITCAP manual for allowed values. This appendix provides a simple example of the entire process of generating a schematic, producing a SWITCAP netlist, running a simulation, and plotting the results. Figure 1 shows the schematic of a simple switched capacitor circuit. Note that some switches, S1 and S3 for example, are controlled by CLK1 while others, S2 and S4 for example, are controlled by the complement of CLK1 (#CLK1). Figure 2 shows the definition of a clock and the master clock. Here we define a master clock period (mcp) of 1.0 μs in the timing block. In the clock definition symbol, we define a clock called CLK1 that has a period equal to 1 master clock period (mcp). The phase of CLK1 turning on switches is 0 and the phase of CLK1 turning off switches is 3/8 mcp. Additional clock phases can be defined by creating more instances of the clock definition symbol. Figure 3 shows an instantiation of the title block symbol which will cause “my title” to be used in the TITLE line in the SWITCAP netlist. Figure 3 also shows an instantiation of an analysis block which directs the netlister to include the contents of the file test.ana in the output netlist. Figure 4 shows the contents of the test.ana file.